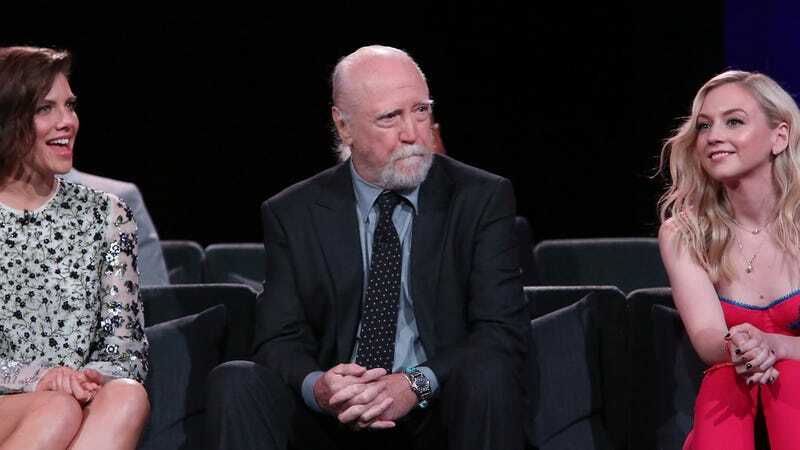 As reported by The Hollywood Reporter and confirmed by the official Walking Dead comic Twitter account, actor Scott Wilson has died following a battle with cancer. Wilson played Hershel on AMC’s hit adaptation of of Robert Kirkman’s comic, and the news of his death came just hours after new showrunner Angela Kang announced that he, Jon Bernthal, and Sonequa Martin-Green would all be returning to the series in its upcoming season (despite their characters all being dead). Wilson had reportedly filmed at least some of his new Walking Dead scenes before his death. Wilson was 76. Born in Georgia in 1942, Wilson got his start in the acting world by playing a murder suspect in Norman Jewison’s In The Heat Of The Night in 1967, and in that same year he played real-life murderer Richard Hickock in Richard Brooks’ adaptation of Truman Capote’s In Cold Blood. Wilson also had a prominent role In the 1974 version of The Great Gatsby, killing Robert Redford’s Gatsby (and then himself) as the bitter and jealous auto shop owner George Wilson. He also had roles in The Ninth Configuration, Dead Man Walking, G.I. Jane, Pearl Harbor, an episode of The X-Files, and The Host. Wilson also had a recurring role as crooked casino mogul Sam Braun on the original CSI. Wilson joined The Walking Dead in 2001 at the beginning of the show’s second season, playing farm-owning veterinarian Hershel Greene. A deeply religious man, Hershel continuously advocated for a non-violent approach to surviving in the show’s zombie apocalypse and acted as the moral center of The Walking Dead’s ever-changing cast of characters. Though he was initially hesitant to accept Hershel’s approach, Andrew Lincoln’s Rick eventually came around to pacifism, even promising to forgive David Morrissey’s maniacal Governor and accept him into their little society after he captured and threatened to kill Hershel near the end of the fourth season. However, in an attempt to prove that the non-violent attitude was misguided, the Governor murdered Hershel. After The Walking Dead, Wilson appeared in Bosch, Omen spin-off series Damien, and Netflix’s The OA. At this point, AMC has not announced when or how Hershel will be returning to The Walking Dead, but with Lincoln leaving the show this season, it will most likely be in a flashback or hallucination.